Lean is about doing more with less: less time, inventory, space, labor, and money. "Lean manufacturing", a shorthand for a commitment to eliminating waste, simplifying procedures and speeding up production. The idea is to pull inventory through based on customer demand. Lean Manufacturing (also known as the Toyota Production System) is, in its most basic form, the systematic elimination of waste – overproduction, waiting, transportation, inventory, motion, over-processing, defective units – and the implementation of the concepts of continuous flow and customer pull. Just as mass production is recognized as the production system of the 20th century, lean production is viewed as the production system of the 21st century. 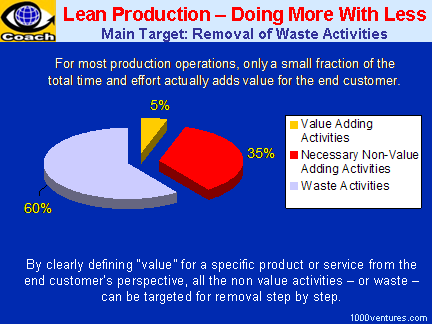 In fact, the processes involved in lean are ideal for any business whose inventory accumulates in buffer stocks. Toyota perfected lean manufacturing in the 1990s, and now the concept is being put to use in other areas, such as organizational structures, distribution and logistics. Though books have been written detailing the steps to achieving lean manufacturing and many manufacturers have tried to emulate Toyota's success, few have actually done so. Why? Because they have failed to adopt lean manufacturing as a management philosophy that encompasses the entire organization. Instead, they see it only as a departmental solution. IBM regularly compare part counts, bills of materials, standard versus custom part usage, and estimated processing costs by tearing down competitor products as soon as the latter are available. The basic elements are waste elimination, continuous one piece workflow, and customer pull. When these elements are focused in the areas of cost, quality and delivery, this forms the basis for a lean production system. The lean production concept was to a large extent inspired by the Kaizen – the Japanese strategy of continuous improvement. Employee empowerment and promotion among them of a way of thinking oriented at improving processes, imitation of customer relationships, fast product development and manufacturing, and collaboration with suppliers are the key strategies of leading lean companies. Lean techniques are applicable not only in manufacturing, but also in service-oriented industry and service environment. Every system contains waste, i.e. something that does not provide value to your customer. Whether you are producing a product, processing a material, or providing a service, there are elements which are considered 'waste'. The techniques for analyzing systems, identifying and reducing waste, and focusing on the customer are applicable in any system, and in any industry. Lean thinking may also be applied for getting rid of bureaucracy in your home office. To run your home office more effectively and faster you may need just as little as 10% of its current staff. Only executives who have a direct involvement with finding, keeping, or growing customers as well as key support staff – accountants, tax, legal and human resources people – should stay. Others can be rehabilitated by sending to an operating unit.